(Osborne 2014) gives the transformer design above using a FT82-43 ferrite toroid with three turns on the primary. The concept is to adjust the antenna length and C1 for a ‘perfect match’. 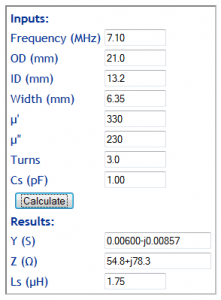 if the system is adjusted to deliver a 50Ω resistive load to the coax connector, then a good approximation of core losses can be obtained by measuring or estimating the complex impedance or admittance of the three turn primary winding. 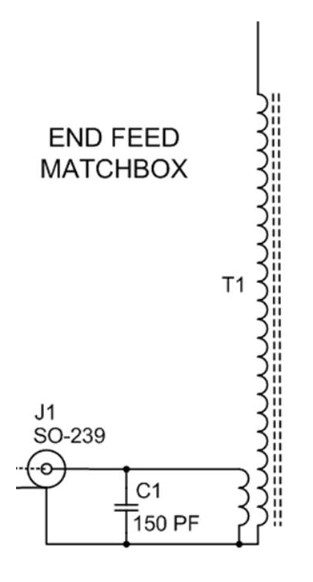 just under one third of the input power is converted to heat in the ferrite core. Not an attractive proposition if using QRP (as is almost always the case with these things). Low efficiency of the matching system is a feature of many of these designs, more so those using ferrite transformers. Do not read this short article to mean that ferrite cores are generally unsuited to this application, or that powdered iron cores a better suited… it comes down to transformer design and a feature of articles describing these things is that (almost) no one lays out quantitative design rationale. Osborne, G. Aug 2014. 40/20/10m End – fed Antenna. 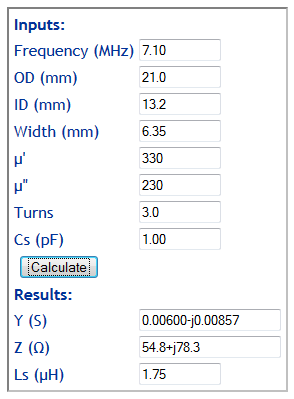 http://www.mwrs.org.au/wp-content/uploads/2014/08/Three-band-End-fed-Half-wave-Antenna.pdf (accessed 25/09/14).